On this video I’m going to teach you a handy trick how you can keep your dry flies dry and floating nice and natural so you can keep catching more fish. If you are into fly fishing note that there is a free fly-fishing sheet for you with for free lessons. You can download it for free at the end of this blog post. How to Dry Your Fly When Fly Fishing? When you are dry fly fishing and you have been doing that for a while the fly gets wet. What you can do is a few extra false casts to keep the fly in the air and dry it. But it’s not super effective. What I like to do. I have a small rubber band. What you would do is to utilize that to dry the dry fly. If your rod has a small loop to place your fly you can use that. Or if you don’t have a loop on your fly rod just wrap the rubber band around the road. When you are dry fly fishing with your fly is supposed to be dry and float nice on the water surface. But after some time of fishing the fly gets wet it doesn’t float so well. At that point, put the fly on the rubber band. Stretch the rubber band tight and flick it few times. That will dry your fly nice and easy. And you can keep catching more fish. The 10k Fly Fishing Experiment continues. This is the last day of my Norway Excursion. 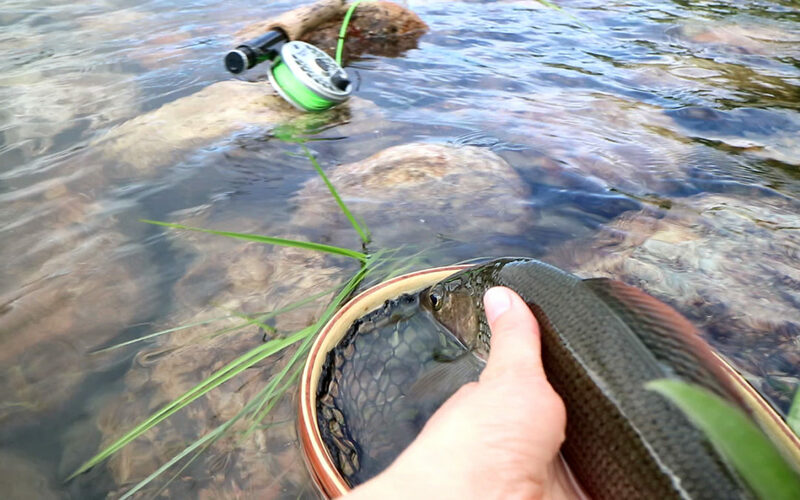 Dry fly fishing for grayling in the Tana River in Norway. (Actually the very boarder of Norway and Finland). Episode 023 of 10K Fly Fishing Experiment. Hours 226 to 250 out of 10000. Fly-fishing in Norway Tana River. It’s all about knowing those little tricks and tips. If you want to learn more I have prepared a free fly fishing cheat Sheet with 4 fly fishing lessons which you can download for free. Excellent writing, I read a lot of blogs, but I liked this blog article. Sorted writings and sounds too. Which is very beneficial for a Visitor. I think that is very good: “On this video I’m going to teach you a handy trick how you can keep your dry flies dry and floating nice and natural so you can keep catching more fish.” Thank you for the valuable writing.